Join organic farmer Claire Strader for a panel discussion about the environment on April 25. UCSC's Reunion Weekend 2009 will feature a panel discussion about the environment with organic farmer Claire Strader and NPR science correspondent Richard Harris, both UCSC alumni, as well as popular UCSC environmental studies professor Daniel Press. The free panel discussion will take place from 10:30 to 11:30 a.m. on Saturday, April 25, in the UCSC Humanities Lecture Hall, following an evening keynote address about "Our Environmental Destiny" the night before by Robert F. Kennedy Jr.
Kennedy's appearance at UCSC's second annual Intellectual Forum will kick off Reunion Weekend 2009 festivities. Saturday's follow-up panel discussion will feature Strader, a graduate of the UCSC Apprenticeship in Ecological Horticulture, and well-known NPR science reporter Harris, who earned a B.A. in biology from UCSC in 1980, as well as Press, chair of the Environmental Studies Department, who specializes in environmental politics and policy. Admission is free, but advance registration is requested. 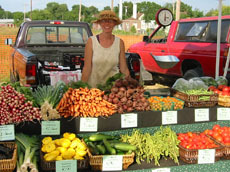 Strader, the director of the Troy Community Farm in Madison, Wisconsin, was the top vote-getter during an online poll that was part of the ongoing grassroots movement to establish a "White House Farmer". Last week, First Lady Michelle Obama broke ground for an organic vegetable garden on the South Lawn, which will be tended by members of the White House grounds crew and kitchen staff. Strader, one of 111 nominated farmers, brings more than 15 years of successful small-scale agriculture experience to her work as farmer and educator at Troy Community Farm in Madison, Wisc. During her eight years at Troy, Strader has turned a five-acre parcel of weedy, urban landscape into a highly productive, organic vegetable farm providing food for 115 Community Supported Agriculture (CSA) members, farmers' markets, and several local grocery stores. She also supports the "grow local" movement through community gardens, childrens' gardening programs, internships, and restoration projects. Strader lives in Madison, where she and her partner keep a small urban apiary and tend a budding backyard orchard. Harris is an award-winning journalist who joined NPR in 1986. As a science correspondent, he has traveled throughout the world to report on stories. A California native, Harris was valedictorian of his Crown College graduating class at UCSC in 1980. After college, Harris went straight into journalism, working as a newspaper reporter before joining NPR. He has earned numerous awards for his reporting and was elected an honorary member of the scientific research society Sigma Xi in 2002. Press is a policy expert whose research focuses on the role of participatory politics in environmental management and protection. He is interested in resource conservation issues, as well as the policy questions that arise around industrial pollution and resource consumption. He is the author of Saving Open Space: The Politics of Local Preservation in California. In 2007, Press was named the inaugural holder of the Olga T. Griswold Chair in Environmental Studies. In addition to his campus responsibilities, Press has served on the Central Coast Regional Water Quality Control Board, which oversees water quality protection in California. To register for this or other Reunion Weekend 2009 events, please visit the web. Sponsors of the Intellectual Forum include Comcast, ZENN Motor Company, and UCSC Arts & Lectures.